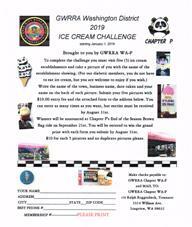 Welcome to GWRRA WA-A, Come ride with us! 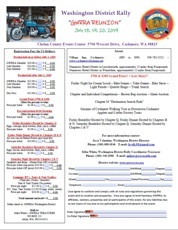 The Washington District Rally Registration form is finally available. To fill it out on line and then print it, go HERE. To download, print and fill it out by hand, go HERE. Our monthly breakfasts and meetings are still the 4th Saturday of every month. We meet at the Golden Steer Steak'n Rib House. 23826 104th Ave SE, Kent, WA 98031. Breakfast is at 8:00am. The Chapter meeting starts at 9:00am. Usually a ride follows the meeting. Read all about the NEW 2018 Honda Goldwing. Do you need a GL1500 or GL1800 Gold Wing Tech Bulletin? Going for a visit to a Local Chapter? How far is it and how long is it going to take to get there? Would you like to know the approximate Distance and Riding time? Or, See the left Side Bar for further Information. Apr 20 ~ 24 WA-V Rest Stop @ the I-5 North Bound Federal Way Rest Area. Apr 27 - WA-V Chapter Maintenance Work Shop. Bring a salad, your favorite soda or a desert to go along with the Pizza that will be furnished by Chapter V.
May 16 - WA-V 6:00 pm Dinner Social ~ Los Cabos Mexican Restaurant, 1316 Supermall Way, Auburn. May 16 - WA-V First Aid/CPR Trailing - 1:00 pm. 8:00 am Helmet Time at the Tacoma McDonald's, 10417 S Tacoma Way, Lakewood, WA. 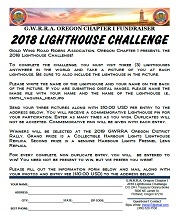 Winners will be selected at the2019 Oregon District Rally. Meet at Enumclaw McDonald's, 110 Roosevelt Ave E, Enumclaw. Helmet Time @ 9:00 am. Traveling Hwy 7 to Morton and then Hwy 12 to Packwood. Intermediate stop at the Chevron Station in Morton at approximately 10:15 am. We'll be going via Hwy 410 over Cayus Pass. No intermediate stops are planned. 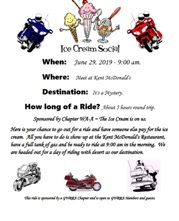 Sep 22 - Anacortes Oyster run - 6:30am helmet time, Kent McDonald's, 8320 S 212th St, Kent. Winners will be announced at Chapter P's End of the Season Brown Bag ride on September 21st.